James K. Polk served as a US Congressman, Speaker of the House, Tennessee’s Governor, and as the 11th President of the United States. He is considered by many to be one of the most effective presidents of all time, having accomplished every major domestic and foreign policy goal he had set. During his four-year Presidency and following the Mexican-American war, the United States expanded significantly by adding the following lands: the annexation of Texas, the Oregon territory and the Mexican Cession of California, Nevada, Utah, Arizona, part of New Mexico, Colorado and Wyoming. He lived in Tennessee most of his life and married Sarah Childress from Murfreesboro, TN. Many Polk home and museum artifacts need restoration. These items range from James K. Polk’s law books, Presidential and family portraits, early White House photographs, to the First Lady’s inaugural gown. The James K. Polk Home and Museum has an Adopt-an-Artifact program. This year the T.S.C.A.R. 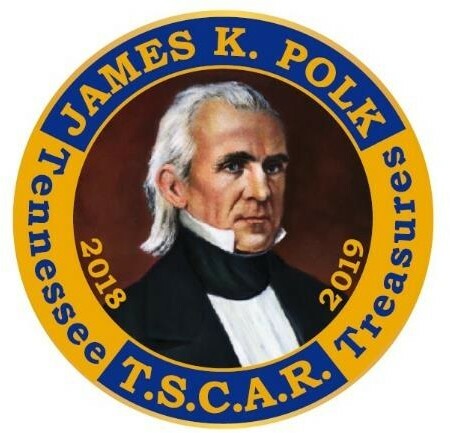 State Project will raise funds to restore the “Tennessee Treasures” in the collection of the James K. Polk Home and Museum in Columbia, TN. T.S.C.A.R. Members will record their community service hours.